Do You Know These Nine Timeless Music Marketing Principles? I’ve been immersed in music marketing since the early 1990s. I’ve witnessed, participated in, and written often about the huge shifts that have taken place. I know first-hand how confusing and frustrating it can be to stay on top of everything – all of the new websites, new technologies, and new routes to success. Hidden among all of these changes are some timeless, irrefutable principles that many musicians, songwriters, managers, publicists, and other music pros have sadly lost sight of. Sure, the tools and tactics evolve. But if you really look under the hood, you’ll find several factors that have always powered the link between musicians, self-expression, fans, popularity, and ultimate success as an artist. 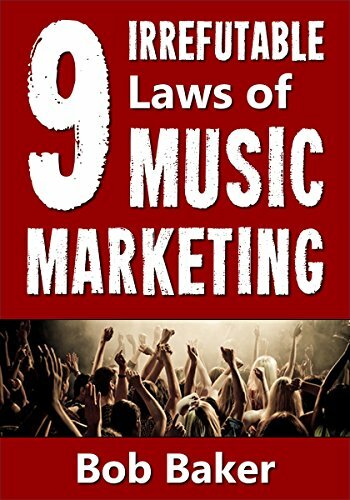 For the purposes of this book, I am calling these factors “Laws.” After decades of intimate involvement with the topic, I consider them to be the foundational, undeniable principles that govern music marketing. These laws were in effect decades ago, they are alive and well today, and they will continue to influence musicians, songwriters, bands, and fans for decades to come. In a world filled with ever-changing options, I find it comforting to know there are some things I can always count on. I may not know what the hot new website or app will be six months from now, but I can be certain that when that shiny new thing pops up, I’ll have a good idea how to use it. And that’s why I wrote The 9 Irrefutable Laws of Music Marketing. To give you a set of rock-solid principles to guide you. With each law, I give you well-known examples and personal stories from my own life in music and marketing. I also give you a short statement in bold text that sums up the main idea of the law. Each chapter ends with a list of ways you can implement the law and put it into practice. I hope these music marketing laws give you the knowledge and clarity you’ll need to make major progress with your career as an artist (or as someone who supports an artist as a manager, publicist, producer, or agent). No one will arrest you or fine you if you disobey them. However, if you seriously use these laws as a set of guiding principles, I truly believe you’ll find yourself with more exposure, more fans, more sales, and you’ll make more of an impact with your music. Please rate and review the book on Amazon after you’ve read it. As an independent author, I rely on your reviews and ratings to increase my visibility on Amazon. If you want other people to benefit from what you learned in this book, please leave an honest review and rating soon.